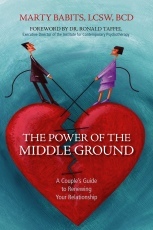 The Power of the Middle Ground explains as no other self-help book does why and how the inherent difficulties entailed in the change process itself are daunting. Author Marty Babits, a seasoned couples therapist and educator, explains strategies and provides tips for grappling successfully with the challenges that change presents. This key aspect of working through relationship difficulties has, until now, been given short shrift in the popular and academic literature. Despite the central place of divorce in our culture, he teaches couples how to achieve a much greater impact in solving difficult interpersonal problems than is often thought possible. Babits helps couples envision a place that brings their potential for love and compassion alive. This place, which neither partner can dominate and in which each learns to approach problems productively, he calls the middle ground. Through a series of exercises, he equips couples to appreciate and actualize what is positive and possible in their relationship. This encouraging, yet realistic book empowers partners to negotiate differences, emphasize the positive, see issues from each other's point of view, defuse anger, and, as a result, rekindle warmth and love.